This is Monday and I'm sorry I'm late with my mingling video. 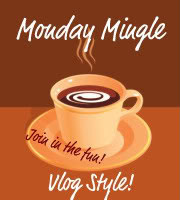 Jennifer from EightyMPHMom is doing a Monday Mingle meme where you just do a video of you, your life, something, anything to get to know you the person behind your blog and what's going on in your life. You can just do a video or use it instead of a post etc. So here is another part of my life. I had fun outside today with the kids and we played in the water and made our own rainbow and the kids were so excited. I love days like these. Thanks for taking the time to listen and watch and I'm coming to visit with you. How my decked look before the sweep: Still trying to catch a sunrise. I love your yard, it is beautiful with all those wonderful trees, and an area of beautiful sunshine. Your children are adorable, thank you so much for sharing a part of your world with us. PS - I hope they don't build a business or a bunch of houses there behind you either. I saw the picture of the sunrise, how wonderful - nature at her finest. What a nice backyard :) Great fun for your two adorable kids!! I can't say I'd blame you for being upset if they end up building a development beyond your fence. Ugh, let's hope they don't. Your voice is so cute! And I love your backyard! It's so nice and spacious!! It was so fun to see your yard and your children - they are absolutely adorable and seem so friendly! I am a little jealous of your HUGE yard - mine is quite small. How neat to see the cane field too - that's not something that most people see every day! Lovely backyard! Your kids are adorable, and they were definitely enjoying the nice weather too! Can't wait for it to get cooler here... We are out in the evening for a while before dark, but days are still very warm. Back up to 110 by this weekend. Blah! Love hearing your voice and seeing your "life" in video! The trees in your yard are so beautiful! I've never seen ones like them before. Thanks for sharing!! You have such a lovely, confident and friendly voice. I was so glad to hear it. Also, your yard is lovely! Even if you do need to replace some boards. And it'll be sad when the cane fields are cut down and your jungle is gone. I also hope it's not sold to a business or housing development. I wish I could enjoy that yard too! And I can't believe I forgot to comment on how adorable David and Victoria are! What lovely smiles and they seem so good together.